Well, not completely brand new, but rebranded. You see, there was an open source instant messaging client called Gaim. Gaim had been around for a long time, and then AOL sued them. Gaim (the word) includes the letters ‘aim’, which AOL trademarked (you know, AOL Instant Messenger), but only after the Gaim team named their software. 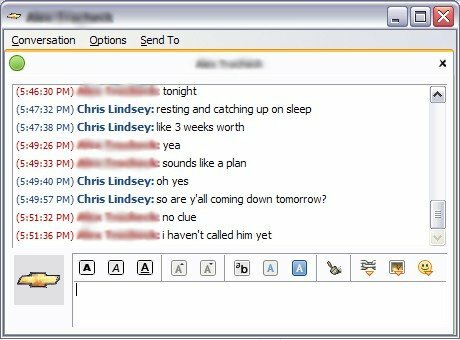 Pidgin supports most instant message networks, including AIM, Gadu-Gadu, Novell Groupwise, ICQ, IRC, MSN, QQ, SILC, SIMPLE, SameTime, XMPP (known as Jabber, and includes the ability to connect to Google Talk), and Yahoo! Messenger. This means you can connect to any network you want to talk to your friends and business colleagues, whatever network they use. The new release is called Pidgin 2.0, because the Gaim project was working on their 2.0 release. The project website is here, and you can download Pidgin 2.0 here. PS- To run Pidgin on Windows you have to install it with the GTK+ toolkit (which is included with Pidgin). For Mac OSX, use Adium, which is a native Mac client based on Pidgin’s underlying toolkit (libpurple). For kicks, here’s a review of Pidgin 2.0 on Ars Technica (it’s a pretty in-depth review) and here’s another. Thanks for the comment, Alex, and I totally agree. Windows Live and Aol Instant Messenger are horrible clients that are bloated, run on startup, and use too much memory.